EDITORIAL UPDATE: Please see the reader comment below. I did not research deeply enough. 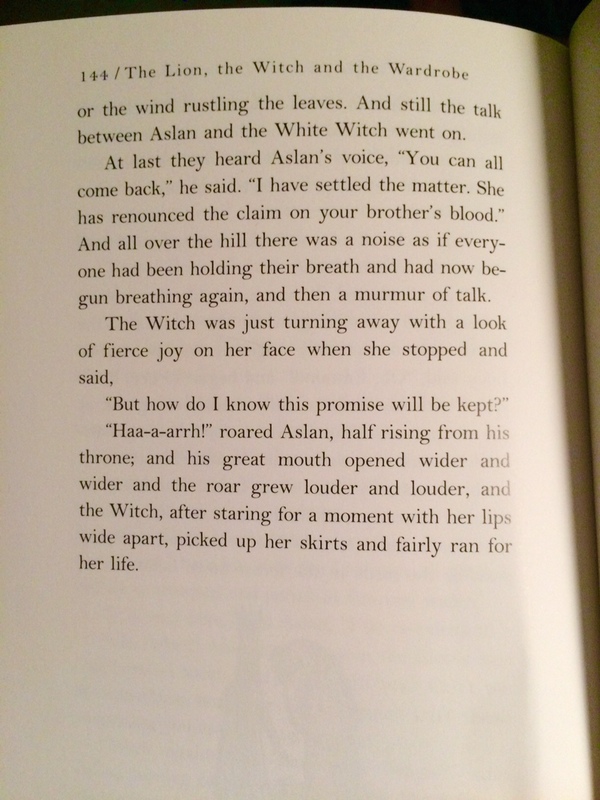 It looks as though “Haa-a-arrh” is in fact the ORIGINAL British version of Aslan’s roar. The first American edition kerfuffled with it and made it “Wow!” to which John Goldthwaite (who apparently also did not do his research carefully enough) took issue. HarperCollins switched it back to “Haa-a-arrh” – and I must now reorient all of my irritation…because there’s always something to be irritated about. And there is always more fact-checking to do. I suspect that had Goldthwaite known this little fact, he would have taken issue with the British version of the roar as well, perhaps deriding it with the same snakiness that I do below because I doubt the roar was ever really the main issue for him. But since he didn’t, I can’t rightfully claim this. I’m leaving this post up for now as evidence of what can happen in the heat of minor literary irritations. Beware. In Goldthwaite’s words: “[Lewis’s] central problem building the parable had always been the difficulty of portraying his Lion of Judah, Aslan, in such a way that the Christ figure would speak with the needed authority yet without intimidating the tale back into those stained-glass and Sunday School associations Lewis wished to avoid. The odds against him were long, and he did not really surmount them–or, rather, he surmounted them and toppled over onto the other side of good judgment.” (p. 222). Any reader – even a child, especially a child – can see quite clearly that this Lion is not a meekly mewling yeller. Besides, Aslan speaks and does a thousand other things that (apparently) are not worth Goldthwaite’s consideration. But Goldthwaite’s tenuous criticism is not the real point. The real point is this: someone actually paid attention to it and considered it credible enough to TINKER WITH THE TEXT. What manner of indefensible foolishness is this? 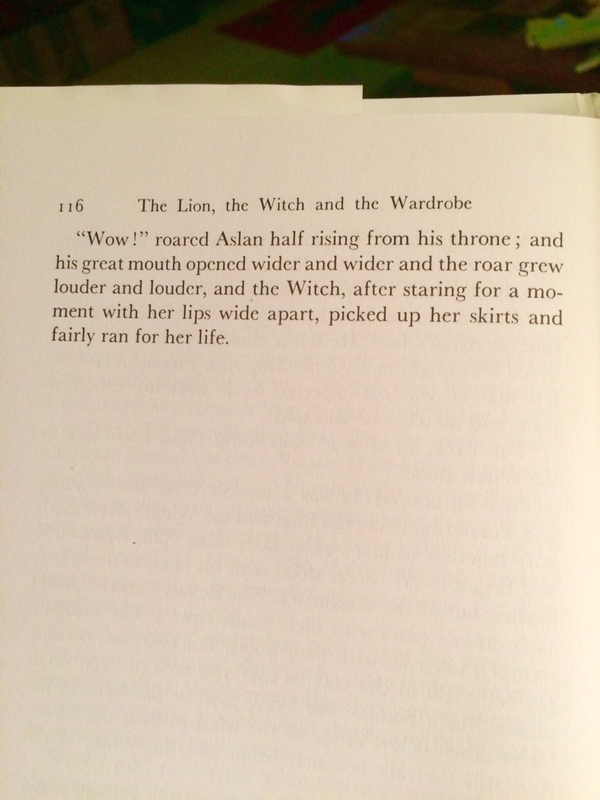 If you happen to own a pre-HarperCollins copy of LWW, you can check the final page of Chapter 13 and see the ‘offending’ (per Goldthwaite) “Wow!” in all its leonine glory. Who decided that this part-laugh + part-sneeze + part-pirate kerfuffle was a stronger reflection of Messianic power and strength than the original Wow? Who?? Sorry to make such a plaguey fuss, but would someone please tell me what exactly is the point of this editorial revision? Do we think children will now, finally, sense “real potency” in both the lion and the text? 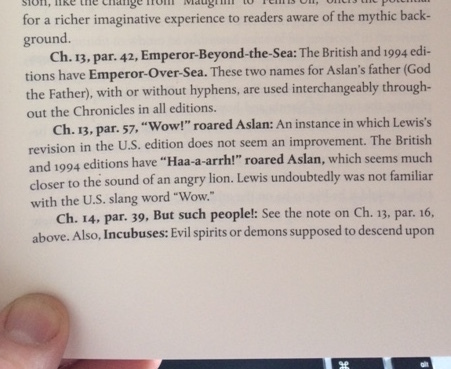 Do we think Aslan’s leonine legitimacy has, at last, been raised a notch or two? Do we think Goldthwaite will, apologetically and humbly, retract his claim and sing Lewis’s praises? Do we think that changing a word – a roar, rather – will mollify the critics and get them to like us better, or at least view us with less disdain? Or should I say Haa-a-arrh? 1. Philip Pullman, “The Dark Side of Narnia,” The Guardian (Oct. 1, 1998), 6. I have accessed this article from two different research databases (LexisNexis Academic and ProQuest) and can attest to its existence. At one time, it was available online via The Guardian. The original public link is now dead, though someone uploaded the article here. * The earliest HarperCollins “Haa-a-arrh” edition I have is dated 1998, a full 2 years after Goldthwaite’s book. The evidence points strongly to the change being made in response to Goldthwaite’s comments, but of course no one at HarperCollins has ever come out and said as much. If anyone has a pre-1996 printing that has “Haa-a-arrh” in it, please let me know so I can retract my complaint, or at least the underlying implications of it. By all accounts, last night was the peak viewing time for the Perseid Meteor shower (per here and here and here and here and a hundred other places). I would give almost anything to see a real Mrs. Whatsit, Coriakin, or Ramandu for even just a split second*. Since that’s unlikely (in this lifetime at least), a meteor shower seemed like a good option. So we set the alarm for 2:00 a.m., climbed into the pickup with our pillows, blankets, and dog, and headed north on 43 in search of glory. To be fair, corn is a glory of Indiana, and I surely do glory in it as much as any other devoted Midwesterner. 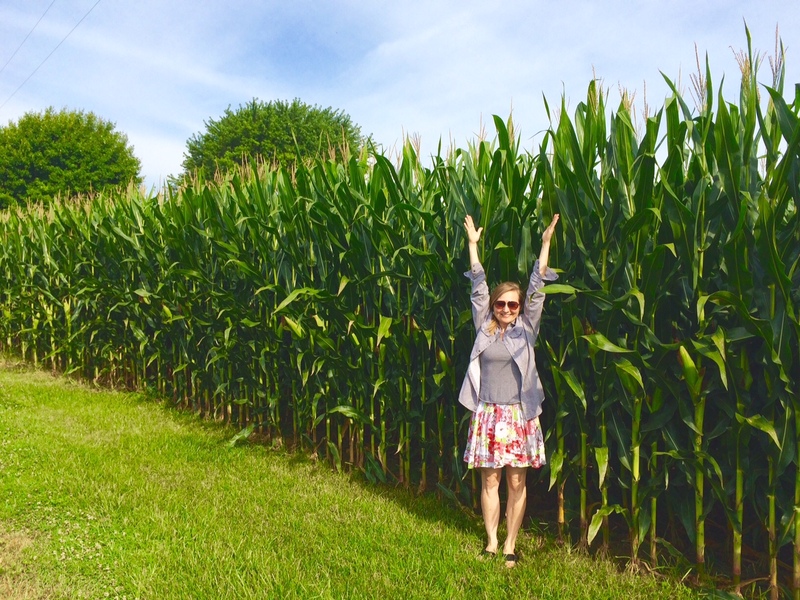 Fact: corn makes me feel small. Even with my arms stretched to the sky, I am dwarfed by those solemn stalks of jade leaves drooping gracefully towards the earth below and those delicate tassels of filagreed gold reaching elegantly towards the sky above. All of that majestic height – row after row after row sweeping across the endless countryside – is stunning not just for its immensity but also for its unexpected smallness; each of those towering stalks gives birth to a single ear of corn (twins and triplets occur sometimes). One ear of corn. All of that height and hugeness and majesty for just one ear. It’s ludicrous in a way. What a (seeming) waste of plant. 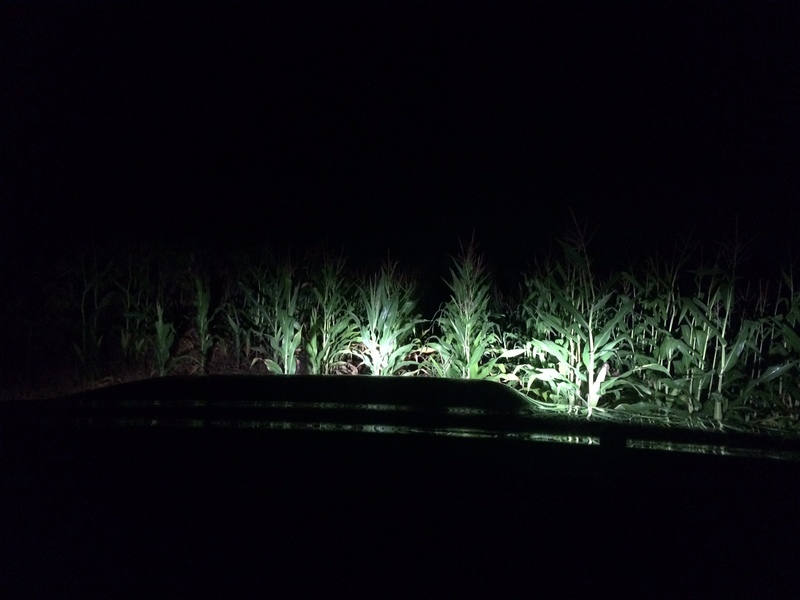 Which brings me back to the Perseid meteor shower that (by all accounts) peaked here in corn-covered Indiana last night. We laid in the truck bed, wrapped against the chill (and also against the hard plastic of the truck liner made of dent- and scratch-resistant plastic molded into an innovative ribbed design – or: bad for the back), eyes wide open, prepared for glory, waiting for majesty. Here’s the thing about glory and majesty: you can’t capture it in words, or in a photo, or in the largest corner of your mind, because words and photos and large corners of the mind are too small to speak or see or comprehend glory and majesty. Fact: the night sky – even without a meteor shower – makes me feel small. Even though I can block out a large swath of invincible lights with my outstretched hand and can compress infinity behind my closed eyes, I am dwarfed by that canopy of heavens reaching down to the earth’s firm edge and soaring up to the sky’s endless cosmos. All of that incomprehensible magnitude – layer after layer after layer sweeping across the endless universe – is stunning mostly for its immensity but also for its unexpected smallness: many of the meteor shower particles dragging streams of trailing light behind them are the size of a pea – as in the vegetable that is much much smaller than a stalk of corn. How can this be? How can a speck of dust stream across the night sky in a blaze of energy that makes you catch your breath and clasp your hands for the sheer beauty and unexpected joy that it brings? That is me. A speck of dust. Tumbling through life, tossed here and there, one of 7 billion souls on the planet, desperately seeking a way to blaze across the sky – not in fame or renown or majesty, but in glory – not the glory of self but the glory of the Almighty. There are (by all accounts) 1 octillion stars in the night sky. That’s 1 plus 29 zeros. Try to fathom that for a minute. Words and pictures and thoughts can’t begin to compute such an incomprehensible number. Even 7 billion (which has only 9 zeros and which [by all accounts] is how many people currently live on this tiny ball of earth) is beyond my ability to compute. So sit in this truth for a moment or a day: each and every one of those 1 octillion stars is named, known, and placed. Each and every one. Surely God has enough on his universe-sized hands to consider small and paltry us not worth his time. Now sit in this truth for a moment or a lifetime: when He considers the night sky, the work of His own fingers, the moon and stars He set in place, He considers them as nothing compared to small and paltry us. Nothing. Nothing. 7 billion people > 1 octillion stars. 1 single soul > 1 octillion stars. Sit in that for a bit and see how it stirs up your soul.